The elaborate security arrangements and traffic restrictions for the Commonwealth Games (CWG) closing ceremony and marathon to be organised in the south and New Delhi districts, respectively, could give commuters a harrowing time. The closing ceremony of the Commonwealth Games tomorrow has given Delhiites a bonanza, as all government and private offices will remain closed. The Delhi police has eased security restrictions for the marathon, allowing spectators at eight spots. Volunteers from Scotland are all ready to perform in the handover ceremony of the Commonwealth Games closing on Thursday at the Jawaharlal Nehru Stadium. 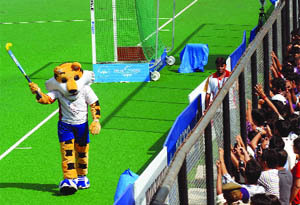 During the ceremony, Delhi will hand over the Games to Glasgow, which will host the next edition of the sports event in 2014. Empty spectators' stands in Games venues have been a major concern for the organisers, but there are no such worries for the closing ceremony that will be held tomorrow as their tickets, like those of a blockbuster, have been snapped up by viewers. The Delhi traffic police today challaned 71 persons entering with their vehicles in lanes reserved for the Games vehicles. With the Commonwealth Games coming to an end, most foreign athletes are packing their bags at the Village, signing autographs, clicking pictures and giving compliments to the staff that entertained them at the Village during their stay here. Both are India's table-tennis sensations and have known each other for the last 15 years, though they never talked until sometime back. There is mixed response of property consultants about the real state business after hike in circle rate announced by the Delhi government yesterday. Even as cases of dengue took a slight dip in the national Capital, with the city recording 69 fresh cases of the disease today, patients with viral fever queued up at the city hospitals here. Goods worth lakhs of rupees were burnt when a plastic factory in Narela caught fire today morning. According to fire officials, it took them more than three hours to douse the flames that had engulfed the three-storey factory in the A-block of Narela Industrial Area. A man was today robbed of Rs 2.5 lakh by some men on a moving Blueline bus at knifepoint in Shahdara. Two women were found murdered in south-east Delhi's Jaitpur 'Gaddha colony', the police said. The Delhi police has requested the public to use public transport tomorrow. Tomorrow, the traffic police will impose restrictions on certain roads and guide spectators in reaching the Jawaharlal Nehru Stadium for the closing ceremony, without inconvenience. From 6 am to midnight: Bhishma Pitamah Marg - from Lodhi Road to Kotla Mubarakpur, both ways. MTNL Building road - from Scope Complex Chowk to Kushak Nallah (iii) and (iv) already closed. From 2:30 pm to 6:30 pm: NH-24 from Noida Mor flyover to Ring Road - Nizamuddin T-point, Ring Road from Bhairon Road T-point to Ashram. From 8 pm to 1 am: Ring Road -- from Ashram to Bhairon Road T-point, NH-24 Ring Road - between Nizamuddin T-point and Noida Mor flyover. There is no parking for spectators in the vicinity of Jawaharlal Nehru Stadium. They have been advised to use public transport to reach the venue. They have also been requested to familiarise themselves with the routes to be taken for reaching the stadium's entry gates. Gate no. 6: Spectators who have to enter the stadium from this gate must take the Metro train and alight at Jor Bagh station. From there, DTC shuttle buses are available which will drop them at 4th Avenue. Then, they should take a pedestrian way through Barapullah Parking and a foot overbridge to reach the gate. Those coming by their own vehicles should reach Safdarjang Airport and park their vehicles there. They can take the Park & Ride DTC air-conditioned coach and get down at 4th Avenue, from where they may walk to gate no. 6 of the stadium. Gate no. 9: Spectators who have tickets/ passes for gate no. 9 should take a Metro train and get down at Jangpura station. From there, they can take a pedestrian path to reach the gate. People using their own vehicles should get down at Silver Oak and walk to gate no. 9. No parking facility is available at Silver Oak. Gate no. 14: Spectators coming to this gate can take a Metro train and get down at JN Stadium station. From there, they can walk to the stadium. Those using DTC focal point buses should get down at Sunehari Pullah parking and from there they can walk to gate number 14. A marathon will be held on Delhi roads tomorrow morning. To facilitate the event, there will be certain diversions on roads. The marathon will pass through Rajpath, Janpath, Dr Rajendra Prasad Road, Red Cross Road, Parliament Street, Outer & Inner Circus of Connaught Place, Minto Road, Deen Dayal Upadhyaya Marg. Traffic will be blocked at South Fountain, Rafi Marg, Janpath, Rajpath, Dr Rajendra Prasad Road, Ashoka Road, Raisina Road, Tolstoy Marg, Outer and Inner Circus Connaught Place, Barakhamba Road, Deen Dayal Upadhyay Marg, Jehangir Road, Bhav Bhuti Marg, State Entry Road, Jai Singh Road, Imtiaz Khan Marg and Talkatora Road. Besides, all shops and other commercial establishments would also be closed. The Central and Delhi governments had issued separate orders, declaring the days of opening and closing ceremonies of the Games as public holidays. The decision was meant to secure the national Capitaland avoid traffic jams as a host of VVIPs would attend the ceremonies. However, as was the case on the opening ceremony day, some cineplexes could open tomorrow. Besides, emergency and essential services like hospitals and media organisations would function. Meanwhile, a Delhi Metro Rail Corporation spokesperson said Patel Chowk and Central Secretariat Metro stations, which were supposed to remain closed for public for six hours between 5 am and 11 am due to marathon, would remain open to commuters from 6 am. All the gates of Rajiv Chowk Metro station would also remain open against the earlier announcement that only gate numbers 1, 2, 7 and 8 would be open for the public. It took this decision after it received flak for overzealous measures during the cycling event which kept spectators away. The security restrictions had taken the charm away from the cycling event on Sunday. Spectators were allowed only at two spots. Besides, many faced difficulties in reaching the designated galleries. The Delhi police has also lifted the restrictions on Patel Chowk and Central Secretariat Metro stations, which are close to the marathon route. The stations will remain open from 6 am tomorrow. "One can watch the marathon that begins at 6:30 am at the lawns of Rajpath, Imtiaz Khan Marg near AIR, RBI to PTI Parking, Hanuman Road/ Park Hotel, Scindia House (Janpath side), Scindia House (K.G. Marg side), Statesman House and Inner Circle," said a police official. Some 350 participants from all over Scotland have been honing their dance moves for the handover ceremony. "Months of preparations and hard work are coming to fruition for the cast members from Lothians who will present an eight-minute performance in front of 60,000 spectators," said an official of the organsing committee. From the Indian side, over 2,500 children from various schools in Delhi and neighbouring districts will participate in 'Vande Mataram' performance. Delhi-based fashion designer Ashima-Leena duo has designed about 3,000 outfits for these children. Also, 550 professional artistes, divided in nine groups, will perform different forms of martial arts derived from the warriors of India. Unlike the opening ceremony, which was more about culture and tradition, the closing event will have bollywood quotient, with the presence of singers like Sunidhi Chauhan, Shankar Mahadevan and Kailash Kher, among others. Indian Sufi singers, Zila Khan and Kailash Kher, would come together to enthrall the audience with popular Sufi numbers. Hindustani classical vocalist Zila Khan will sing two solos followed by two duets with Kher. Both the singers would also participate in a medley of songs by different artists. Kher who leads his band Kailasha has composed the Games song 'Yaaro Jashn Manao'. "The closing ceremony is more focused on celebration and fun as those who have won medals will celebrate. The whole mood will be very different. The purpose of the closing ceremony will be enjoyment and celebration," said Prasoon Joshi, who is part of the three-member committee formed for the event. The opening ceremony was a houseful affair and lived up to its billing. But the closing ceremony's tickets have been more sought after, with apprehensions among Delhiites about organisers' ability in pulling it off. An organising committee (OC) official said that economy tickets worth Rs 750 were sold long ago, while the rest costing Rs 4,000, Rs 20,000 and Rs 50,000 were sold in the last days. A few days ago, the OC office at Jantar Mantar had reportedly witnessed some unruly scenes. Many, including volunteers, allegedly barged into the office, demanding passes for the ceremony. The organisers had promised to give passes to volunteers and private groups, but they allegedly hoarded the passes to please the VIPs. "Everybody wants to watch the ceremony. Possessing the passes is a status symbol for many. We have many requests from people as tickets have sold out. People's expectations from the event are very high," an official said. The closing ceremony will be a song and dance celebration high on fun and entertainment, unlike the opening ceremony which was a grand spectacle on India's cultural and historical riches. Wizcraft International is organising the closing ceremony too. "I don't know about the show. But I am sure that it will be worth my time and money. They did a great job in the opening ceremony," said Saurabh Mishra who is looking forward to watch the ceremony. "Six notices were sent to vehicles violating the Games lane restrictions, while one vehicle has been impounded," said a traffic police official. The traffic police has issued a total of 2,139 challans since the exclusive lanes came into effect on September 23. A total of 315 notices have been issued and 29 vehicles have been impounded. The restrictions will continue till October 16. Most athletes and their chefs de mission are happy, calling it one of the best experiences they have had. It looks like that initial hiccups have been overcome, and those returning home have nothing but good to say about the Indian hospitality. Even as many players have already returned, others are eagerly waiting for tomorrow's closing ceremony. "These events are of a large magnitude. We understand that there are problems and shortcomings. The pressure is immense. But soon after we arrived, things started looking up. On the opening ceremony itself, we knew that things are only going to get better. We realised that maybe there were negatives, but there are a lot of positives to look for as well. We have had a splendid games and a memorable stay here at the Village," said Chef de Mission Australia Steve Moneghetti. He was reportedly unhappy earlier at the opening ceremony when the Austrailan contingent had to wait in a tunnel for more than an hour. "We will encourage all Australian athletes still in New Delhi to march in the closing ceremony as well," he added. Initially, the Games had come in for a lot of criticism from the country, for the lack of preparedness and hygiene issues at the Games Village. Christine Dufus, netball player from Canada, said, "I wish we could stay here for some more time. I can't believe the games are already over. I am going to miss the chit chat sessions with the volunteers. We had some crazy fun dancing on Bollywood numbers and trying spicy Indian food. The volunteers even taught us how to eat butter chicken, Indian style. It was messy but absolutely divine." "To make a win for our country is our foremost concern. But the surroundings around you definitely affect your frame of mind. With negativity all around, performance might suffer at times. Thankfully, we did not have to worry about that here in the village or at any other venues. Even if we had a problem, we spoke about it, and it was taken care of the very next moment. Communication is the key in such cases. We were not here to complain, but play and that's what we did," said Nigerian swimmer Maarcus Fisher. Athletes gave suggestions for improvements and also bestowed compliments, befriended staff members, had practice sessions and fun time at the games village. "I have made some very nice friends here. I have added them on Facebook and Twitter as well. Internet will make it easy for us to be in touch. We went out shopping for a couple of days, and people recognised us, came up to us and asked us if we needed any kind of help. We were touched by the generosity and the gestures. We have indeed had a gala time and we sure will miss it. I hope to come back to Delhi soon," squash player Duncalf from England said. Soumyadeep Roy and Poulomi Ghatak who lost in the semi-finals of table-tennis men's singles and women's doubles, respectively, and will try their luck for the bronze medal tomorrow, are looking forward to a new life together after the Commonwealth Games (CWG). They are tying the knot in February next year. Even after having played together for many years, they never thought of marriage. It was only when their common friend Sharath Kamal, who bought gold medal to India in men's double table-tennis match in the CWG asked them go ahead and break the ice. It did not take much time for love to blossom when they started talking. "We never got along. In fact we hated each other's company. We did not speak for seven long years. Then, Sharath asked us to start talking. We became good friends. But before we could become the best friends, we realised that we are in love," said Poulomi Ghatak, a six-time national champion. The CWG is the first sports event where the participating national players are a couple. "I always need her motivating words. I have defeated the 2006 Australian CWG silver medalist, though it was bit unlucky for me today. Hopefully, with her support I would do well tomorrow," said Roy. While Ghatak feels that it is Roy's presence that keeps her motivated. "It is always good to have Soumyadeep behind me during my games. His presence motivates me. I have experienced this in the Games. I hope our company helps us sail through all the hurdles," said Ghatak. The hit couple have a grueling schedule ahead, with events like the Asian Games in Guangzhou and the Nationals in January. "Hopefully, we will get a month and a half break in February for marriage," said Ghatak. Some of them are of the view that it will have negative affect on the real estate business while others say that though the government's decision will make property costly in the capital, the sale and purchase will not come down. Upender Singh of Envision Consultant said investment in property is made by those who have black money. Now, with hike in circle rates, the buyer will have to show white money in maximum that will discourage them. Only needy people will purchase property in the Capital. As far as middle class is concerned, it will get more amount as a home loan but they will have to pay the double amount as stamp duty. Consequently, they will think twice before purchasing a house in authorised area. M. A. Usmani, director, Adarsh Infratech Private Limited, is of the view that with the enforcement of new circle rate, sale of property will come down but rates will become stable. It will be easy for middle class people, who prefer to show most of the purchase amount in white to get more home loan. An official of Balaji Promoters said this decision of the government would not be good for investors in property as the investors would have to pay double stamp duty that would go in lakhs. Another property consultant said the hike in circle rate would encourage people for purchasing property in unauthorised colonies where it is cheap. Circle rate is enforced only in authorised areas. Major government hospitals like All India Institute of Medical Sciences, Lok Nayak Jai Prakash, Ram Manohar Lohia and Safdarjung Hospital have been seeing scores of patients with high fever, both in the emergency as well as the out patient departments of medicine and paediatrics. The daily turnout of patients with symptoms of dengue, chikungunya, Influenza A (H1N1), seasonal flu remains between 60-80 in each of the hospitals. Meanwhile, the Capital's cumulative tally for dengue has surged to 4,313 cases, which is much more than 3,336 cases of 2006's outbreak. Further, as many as 21 positive cases of chikungunya have already surfaced against zero cases last year. The authorities attribute the rising viral trend to the CWG construction and high rainfall. "A fire call was received at 5.15 am and we rushed 30 fire trucks to the spot. Nobody was injured in the mishap," said a fire official, adding that the cause of fire is yet to be ascertained. According to the police, the victim, Murari, a resident of Vishwas Nagar, had boarded bus number 221 at Kashmiri Gate around 11 am. "Four people boarded the bus after Murari. Some time later, the men at knifepoint asked Murari to handover the bag carrying money. The driver and conductor of the bus came to Murari's rescue, but were stabbed by the robbers, who then fled the spot with money," said a police official. Angry over the incident, several Blueline drivers and conductors held protest and raised slogans against the police. A case of robbery has been registered at the Shahdara police snan. The incident took place in house no. D 840. on Tuesday late night. The deceased have been identified as Shabana (30) and her mother-in-law Tamzin (60). A PCR call was made after a neighbour saw the bodies. "It was a horrible scene. Tamzin had been strangled with a handkerchief while Shabana was lying in a pool of blood on the floor outside her bedroom," said Nazim, a neighbour. The police is suspecting Shabana's husband Illiyas for the crime.